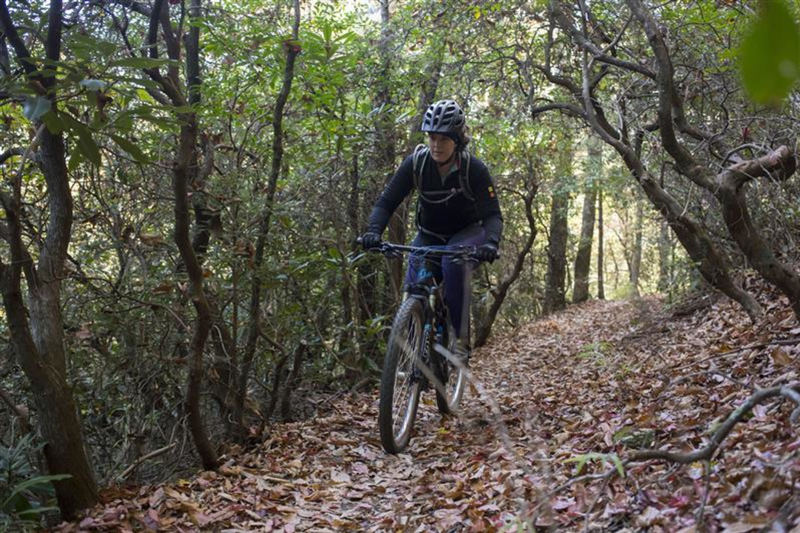 While there are no truly “beginner” mountain bike rides to be had in the Pisgah National Forest, this combination of Black Mountain, Sycamore Cove and North Slope is one of the best Pisgah loops for first-timers. 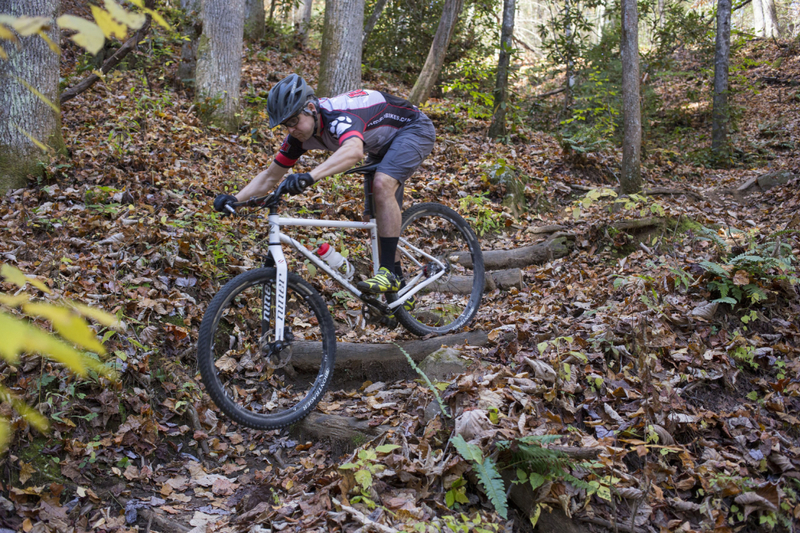 It’s a classic warm-up for those who’ve already spun their cranks at DuPont or Bent Creek. 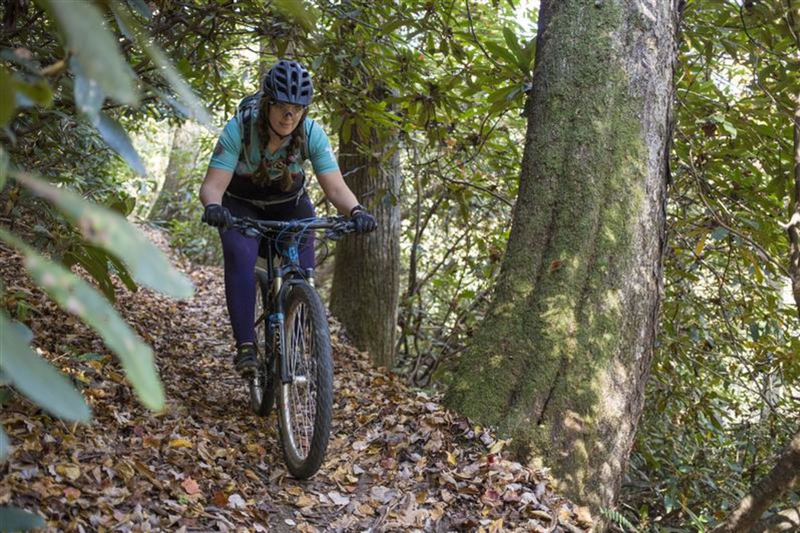 While there are no truly “beginner” mountain bike rides to be had in the Pisgah National Forest, this combination of Black Mountain, Sycamore Cove and North Slope is one of the best Pisgah loops for first-timers. 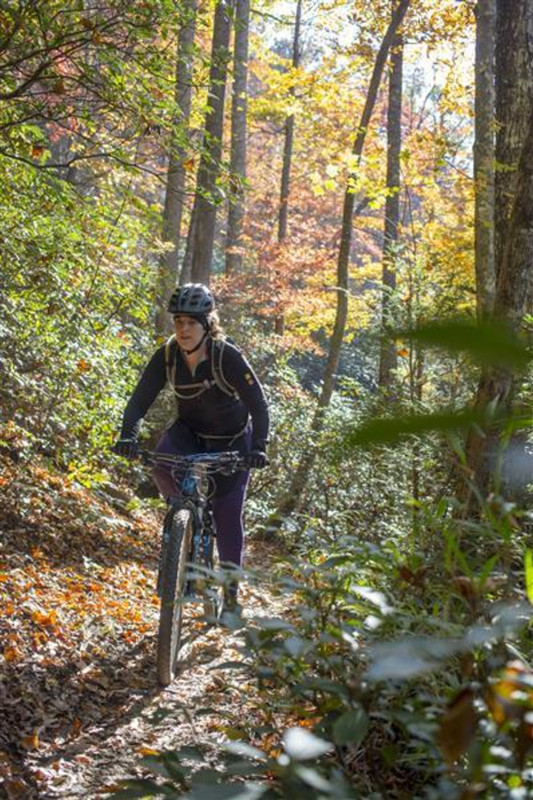 It’s a classic warm-up for those who’ve already spun their cranks at DuPont State Forest and Bent Creek Experimental Forest. 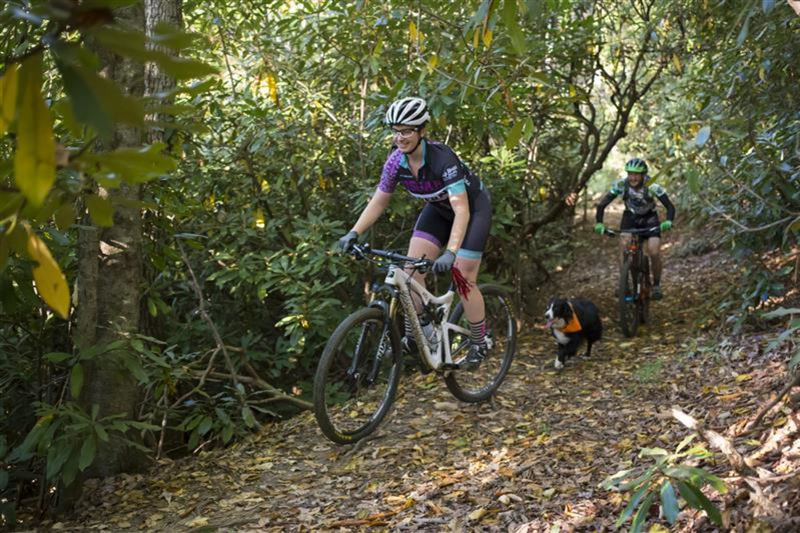 The trail surface still has a healthy dose of root gardens and rock armoring, but nothing one might call technical (in western North Carolina terms), and it’s hardtail-friendly. 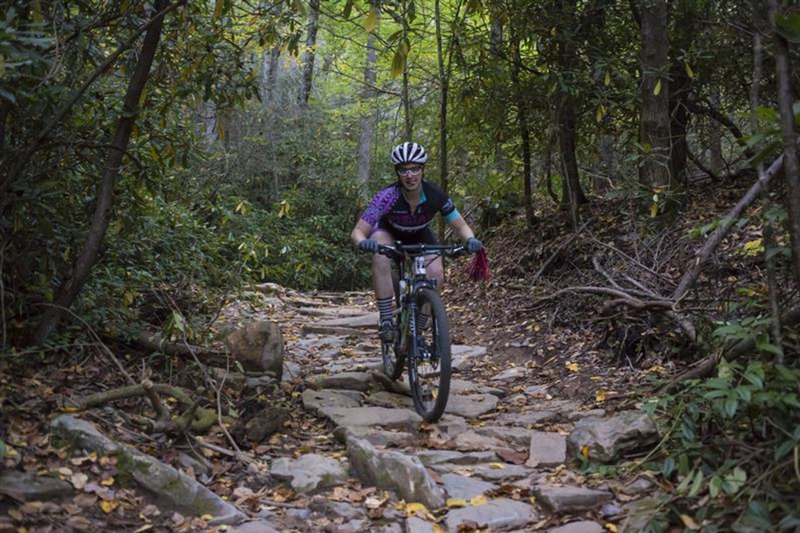 Expect a good bit of climbing and a thorough tour of what makes Pisgah MTB special: rocks, roots, rich soil, deep rhododendron tunnels, narrow singletrack, burbling trailside creeks… and did we mention the climbing? 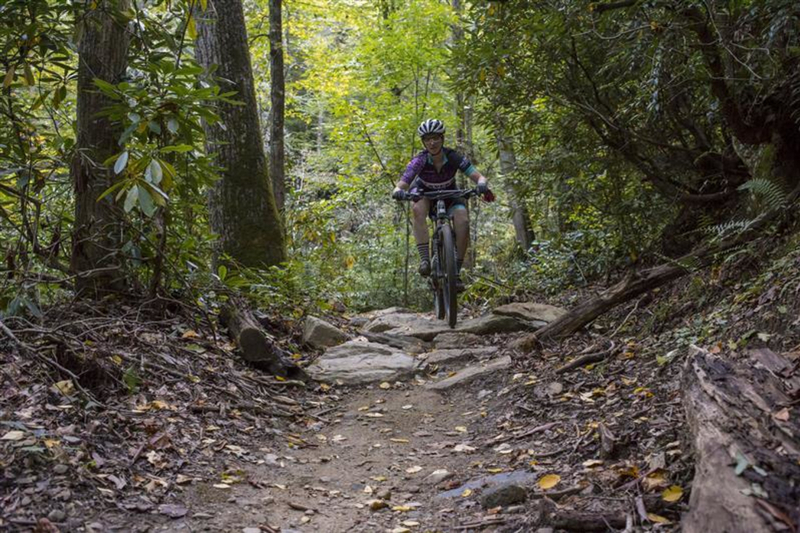 While we’re billing this as an introduction to Pisgah mountain biking, it’s still a 13-mile loop with over 2800 feet of elevation gain. 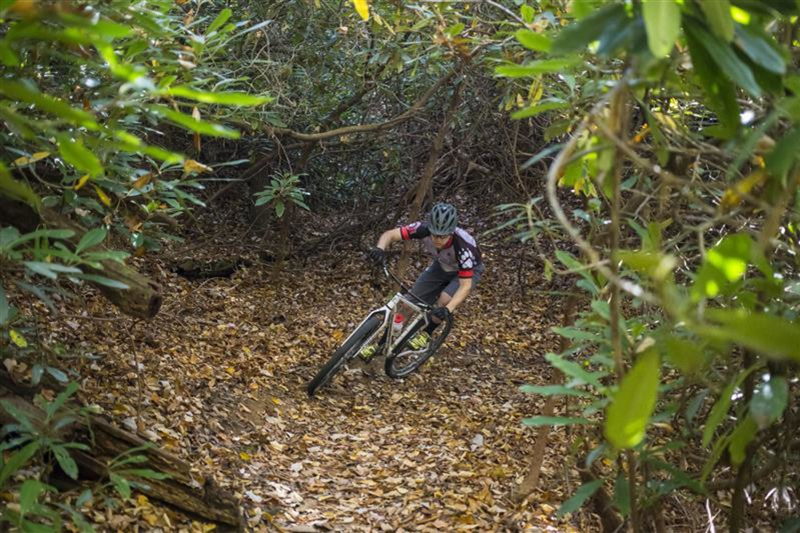 If you’re looking for a quickie from the Davidson River campground, or would simply like to dip your toes in the pool with something a bit shorter, try riding the North Slope Trail by itself (see below) or just the first half of this ride (Thrift Cove, Black Mountain, Grassy Rd, Sycamore Cove). Starting at the Black Mountain Trailhead, you’ll go around a gate and head up a section of gravel before reaching the signpost at the bottom of Black Mountain. This is where you’ll come out. Stay right and begin climbing. When you come to a fork in the trail, stay left onto Thrift Cove Trail. This is an old logging road, and climbs steadily up the hillside for about 2.5 miles. At the top, you’ll meet the Black Mountain Trail again; this time, take a left. The section of Black Mountain Trail from its junction with Thrift Cove to the bottom is known as Lower Black, and thanks to a herculean effort by the local SORBA chapter, the new Lower Black hardly resembles the Lower Black of old. What used to be wet, eroded doubletrack has now been converted to singletrack trail, with plenty of rock armoring, grade reversals and a couple of new bridges. The speeds are a bit slower, perhaps, but the lines are super fun – and the new trail drains well, making it much more sustainable than its predecessor. Despite the rock armoring and the grade reversals (depending on your velocity, you can pump them or jump them), the flow of this trail is excellent and it’s never very technical . Enjoy your descent down this gem of a trail, catch some air here and there, and keep your eyes peeled for other trail users; this area near the campground can be very busy. After a final drop over some heavy rock armoring, you’ll find yourself back at the Black Mountain lower signpost. Take a left and start climbing again – just like when you started! – but this time, instead of bearing left onto Thrift Cove, bear right at the same junction onto Grassy Rd. This climb is much mellower, and will take you to Sycamore Cove. Soon, the trail levels off, and you’ll find yourself at a two-way junction. This is the Sycamore Cove Trail, which forms a loop. Take a left, find an easy gear and punch your way up a fun series of root gardens. Even after it levels out and starts back down, this section of trail remains crisscrossed with roots; a little bit of rear suspension goes a long way here. 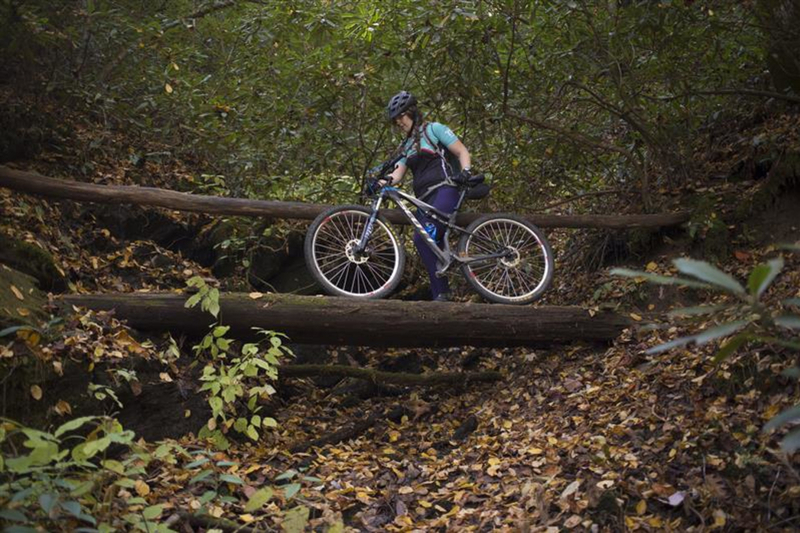 You’ll weave through deep rhododendron thickets, classic Pisgah Forest terrain, on a narrow bench-cut trail. Keep your speed in check, as a couple of sharp corners and minor obstacles require good line choices. 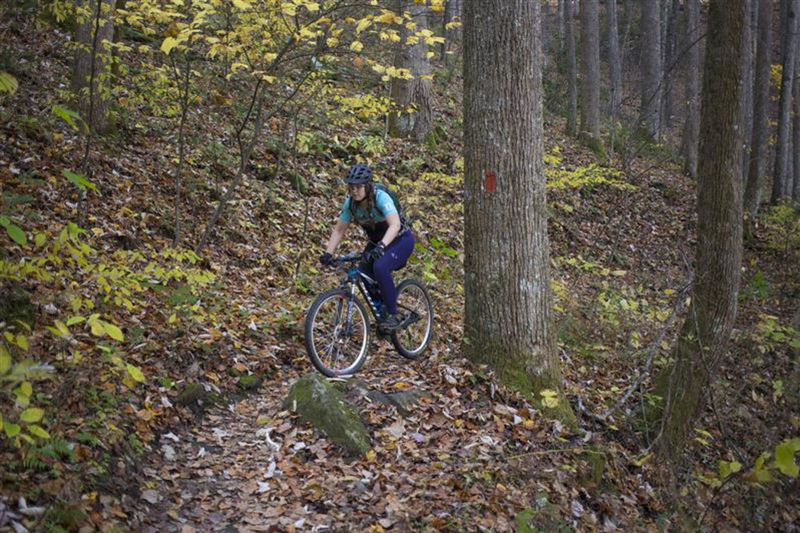 This is classic Pisgah mountain biking, technically moderate singletrack carved into a lushly-forested mountain slope. After a sharp right-hand switchback, the trail turns away from the contour of the hillside and dives back southward. The roots are gone now, but some rock armoring and fun trail features will keep your suspension busy. Shortly, you’ll find yourself back at the road. If you’re tired and ready to call it a day, or if the seasonal trails aren’t open, you can take a right and cruise back to your car from here. At this point, you’re 7.5 miles into your ride. 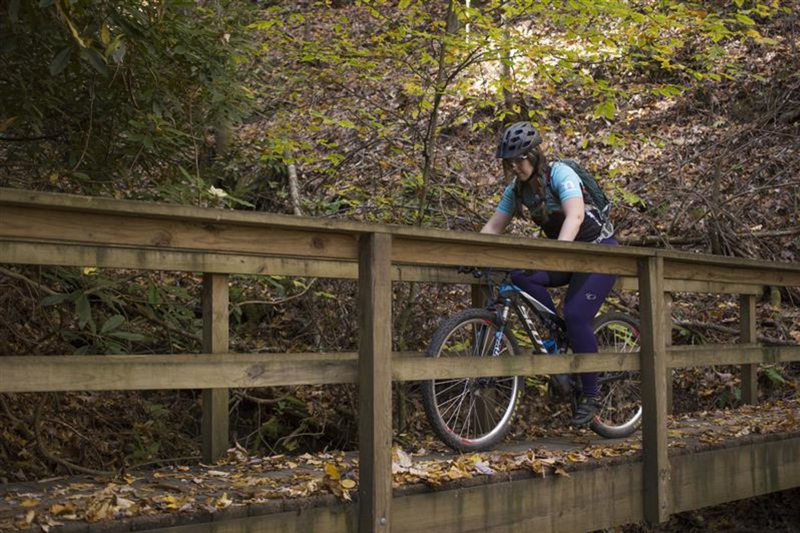 If you’d like to continue, take the same right back onto 276, then look for a pull-out on your left; the trail behind it will take you across the Davidson River on a beautiful metal arch bridge. Take a right onto the greenway and pedal along the river until you reach the campground. Go past the registration hut, turn left toward the ampitheater and ride until you see the North Slope access trail. There are several access trails in the campground, so don't worry if you get confused; nearly every trail on your left-hand side will take you to North Slope. North Slope Trail is a “seasonal” trail, meaning it sees so much foot traffic during the summer months that it’s only open to mountain bikes between October 15 and April 15. Be sure that the trail is open before riding. North Slope forms a loop on the aptly-named North Slope Ridge. We recommend counter-clockwise. You'll ride on an old road bed along the river for a while, then reach a series of massive log steps that nearly all riders hike up. At the top, keep climbing until you reach the junction with the Art Loeb Connector. Whew! Take a left and enjoy your reward: more narrow, lush hand-cut trail clinging to a beautiful wooded mountainside. 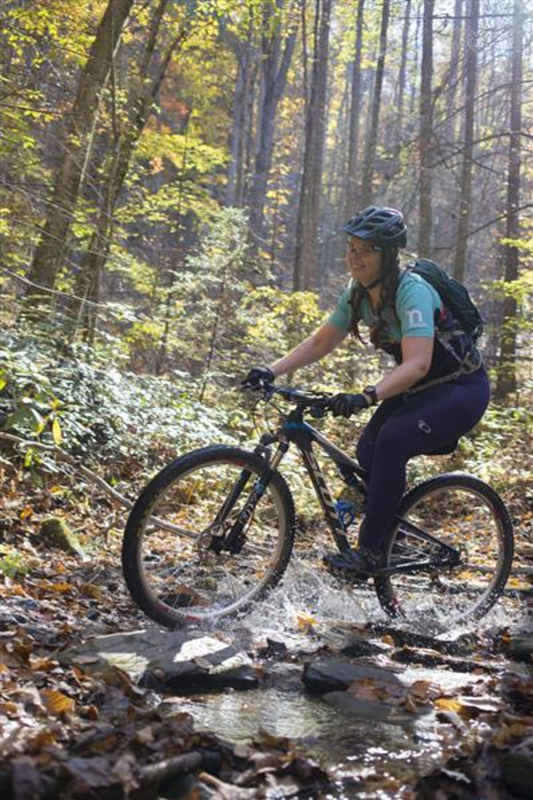 There are plenty more roots, some slick wet rocks and a couple of log bridges that only the dangerously insane attempt to ride. 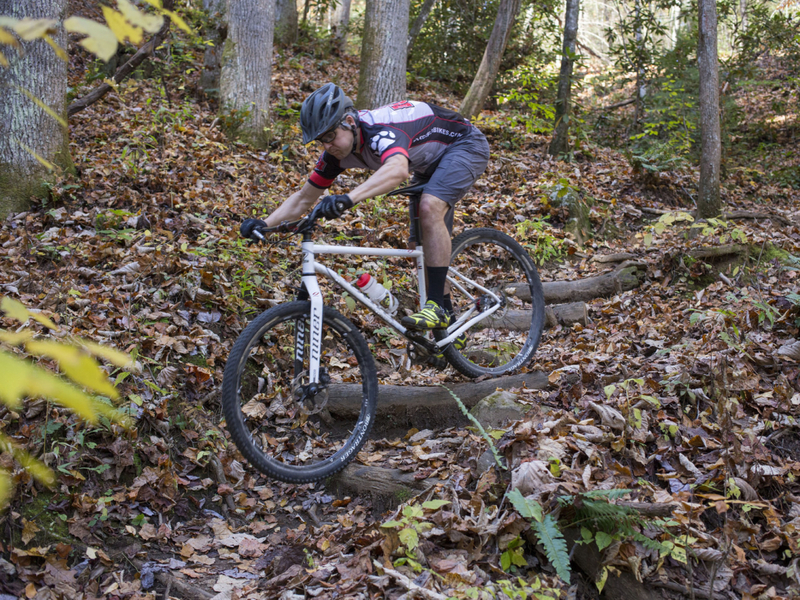 Toward the end of this rooty downhill, a few short staircases tempt the technically-skilled. 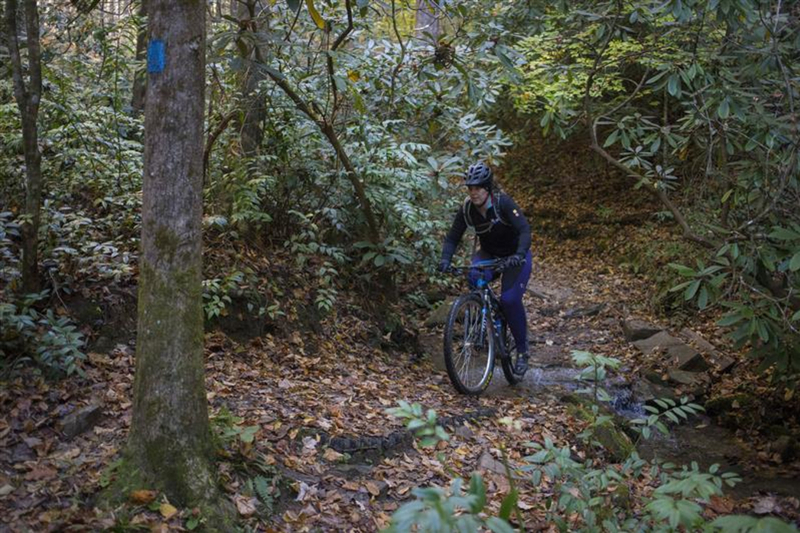 This is part of your introduction to Pisgah National Forest riding: it's up to you to make good decisions and stay within your ability level. Most riders walk these, and there's no shame in hiking your bike for 25 feet in order to live another day. At the end of the trail, you'll find yourself back on the campground pavement. Ride back to the main entrance and cross the street; the parking lot where you started is just to your left, perhaps 50 feet down the road. Park at the Black Mountain Trailhead. It’s poorly marked, but coming from Brevard it’s the parking lot on your right just before the Pisgah Ranger Station, just over a mile from the 276/280 intersection. Look for a sign that says FS 5093 on your right.